My love to bird started very young, as young as elementary school. My school back in upstate New York offered a birding club and I decided to join to have something fun to do. In the club we not only learned about birds, but we also went on trips to places such as Lake Ontario, local forests and marshes to spot the many varieties of birds in the area. As I grew up the love of birds didn&apos;t go away, it was just put on the back burner. A passion for birding took flight again, so to say, during a stressful time in my life. Watching birds brought me peace, even if it was only from the comfort of my home. Though I knew of the extensive birding possibilities throughout Northwest Indiana, I never really investigated it. To be completely honest, I had been too scared. I was worried that more skilled birders might scoff at my lack of skill and knowledge. 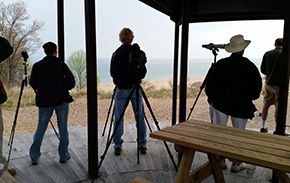 With the opportunity to attend the Indiana Dunes Birding Festival, I have been able to experience far more than I could have imagined. In my first day of birding, I saw more than 20 different birds that I&apos;ve never seen before within three hours. One of the things I was most worried about was the fact that I am, for all intents and purposes, a novice. I thought this would be a disadvantage to me, but it ended up not being a problem. 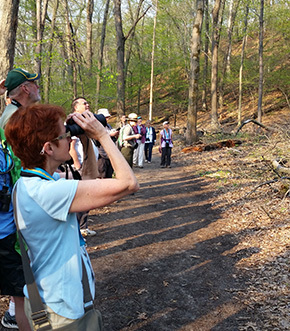 Many of the more seasoned birders were more than willing and excited to help me find birds. They shared stories of how they became involved in birding, many stemming back to childhood just like me. Many times, if there was a hard to see bird or a rarer one they wanted to make sure I saw, they would call my attention to it. This is one aspect that I absolutely love about this festival. There is a great mix of people who are attending. Everyone is willing to help - young or old, novice or expert. There was no difference in us. The most special aspect of this festival is the wide variety of birds. There have been many birds that I&apos;ve always wanted to see such as the Pileated Woodpecker or Cooper&apos;s Hawk that I can now mark off my list. The diversity in the birding population is amazing in Northwest Indiana. Even while we were birding, new birds that don&apos;t usually inhabit the Indiana Dunes popped up due to migration. After only two days of birding in the Indiana Dunes and all along the South Shore, I can say without a doubt that I will be taking many of the skills I have learned from other birders and use them in my own bird watching. I can&apos;t wait to go back to see more of what the South Shore has to offer during the next two days of the festival!